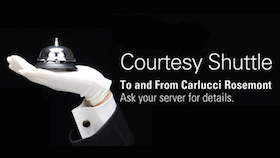 Impeccable events...to recognize a romantic pair, to meet with colleagues for visionary plans, or simply to celebrate life's special milestones, events at Carlucci are perfectly authentic. Gather in intimate, elegant rooms that reflect the ambiance of a countryside estate. Whether raising glasses at the Bar or applause for newlyweds, Carlucci exudes the warmth of a close Italian family. Each room has complementary WIFI and LED monitors. This private space just off the main dining room accommodates up to 36 guests. Exposed beams and 16th century-inspired oil painting provide a distinctively European backdrop. 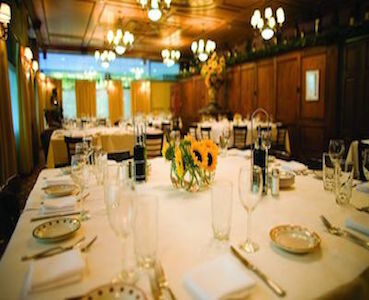 Rich wood trim, tasteful chandeliers, and a vibrant ceiling painting overlook this elegant trattoria setting that accommodates up to 150 guests. 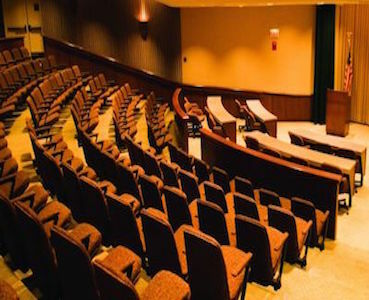 For speaking engagements or motivational meetings, this state-of-the-art theater provides ample seating for up to 200 guests, complete with audio/visual capabilities. Mingle with up to 50 guests in this beautiful intimate room for small groups and gathering space with an LCD monitor. 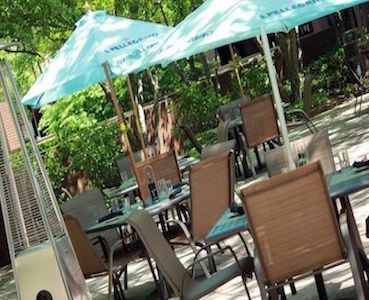 The bar is an intimate space offering daily appetizer and drink specials. .
Alfresco dining is like being at an outdoor café in any Italian city. Our fountain is the centerpiece of activity for dining, hosting large groups or an intimate gathering. 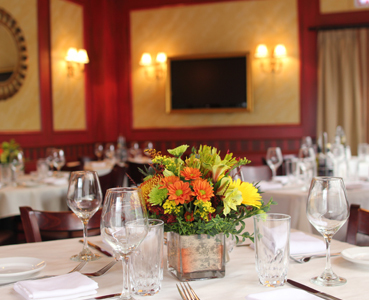 Since opening its doors in 1989, Carlucci has become a local favorite for restaurant patrons throughout Chicagoland, racking up dozens of awards and is frequently recognized by the restaurant industry and local press. Carlucci is listed among the top 50 restaurants to visit in Chicago. 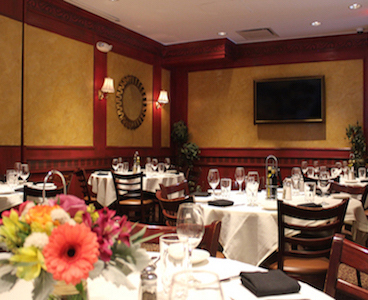 Carlucci is the perfect fit for any occasion lunch or dinner--Be it a romantic date, a business meeting, a quick bite before the show or an evening out. With the addition of seasoned culinary experts-familiar with the nuances of fine Tuscan cooking-Carlucci has raised both taste and service standards. Painstaking attention not only to the palate-but also to presentation and dcor-make Carlucci a destination dining experience. Our Tuscan inspired menu features selections made from quality ingredients that bring out the big bold flavors in each of our creations. At the same time our innovative preparations are the same as those you would find at fabulous restaurants in Italy, where a dedication to simplicity is surpassed only by the pure enjoyment of love of food and life that is so important to the Italian culture. 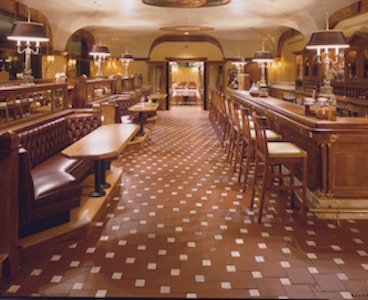 The bar is an intimate space offering daily appetizer and drink specials. The "neighborhood" atmosphere and hospitality of our friendly, knowledgeable bartenders make Carlucci an after-work gathering spot and a comfortable place to catch up with friends to sip wine and enjoy other exceptional drinks. The patio at Carlucci is like being at an outdoor caf in any Italian city. Our fountain is the centerpiece of activity for dining, hosting large groups or an intimate gathering. The layout makes it convenient for a romantic alfresco dinner, getting together for private parties or just a special night out. Our chefs produce superb Italian cuisine that distinguishes our restaurant as a Chicagoland and northwest suburb favorite. With memories of food revolving around the family kitchen and home cooking. They have a driving passion for serving up a unique experience. © Copyright, 2019 Carlucci Rosemont. All Rights Reserved.